It is hardy in USDA zones 2 through 9 and has a moderate growth rate. 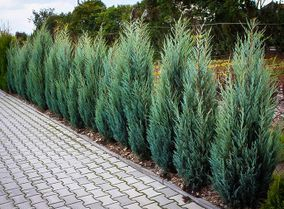 Juniperusscopulorum "Skyrocket" is one of the narrowest junipers available. It can grow to 20 feet, with widths of only 2 or 3 feet. This is a fast growing juniper that has fine, feathery blue foliage. Sky Pencil Holly trees have a narrow, upright growth habit that hardly takes up any space. 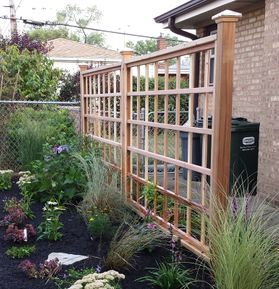 They add height to gardens without taking them over and look beautiful with thick, green foliage all year. Sky Pencil hollies are narrow, columnar shrubs that grow up to 8 feet tall and 2 feet wide. With pruning, you can maintain them at a height of 6 feet and a width of just 12 inches. 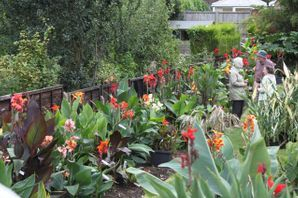 Canna lilies grow 2 to 6 feet tall and look best when planted behind shorter flowers. Cannas, a genus of tropical and subtropical flowering plants, spread quickly underground through rhizomes and require division every few years to control the rhizomes and prevent the cannas from becoming overcrowded. 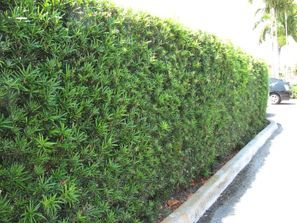 Podocarpus usually grow to between 20 and 35 feet, though they may be kept smaller with pruning. 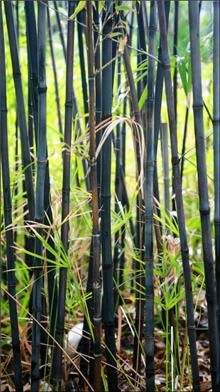 They are fairly rapid growers, adding about 24 inches in height in the course of a growing season.